Ruby is a kitty who came to HART as part of a litter of seven (!) kittens - five of whom were "tuxedo" kitties (black and white). Ruby loves attention, cuddles, and play, and is a huge PURR-er. There is something very special about this cat family - although we can't be certain, we suspect that there are Burmese ancestors in their family tree: the Burmese is a breed of cat originating in Thailand, and the breed name means "fortunate, beautiful, and splendid appearance" in the Thai language. :o) Burmese cats are known for being sociable and friendly with humans, as well as being very intelligent. 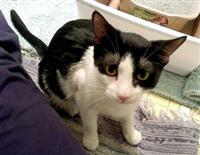 If you would like to sponsor this cat, please click here.